The MotherFuckers - We're Fucked LP Back in 93 Beer City booked a crazy Milwaukee band who went by name of The Motherfuckers to play a homeless benefit they had had organized. Right after seeing them live, how intense they were and the incredible no holds barred HXC they played ; Beer City decided to put out a 7" for the band. It sold 2000 copies almost instantly. The Motherfuckers were an amazing band. Their live shows coupled with a we don't care drunk punk attitude instantly won all over all true fans of punk and HXC who were (un)lucky enough to catch the band at a show. 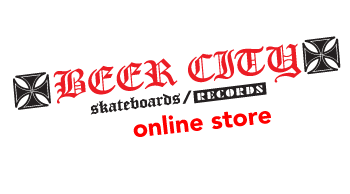 Following the success of the first seven-inch, Beer City knew it wouldn't be long before they had to do another. Unfortunately due to drugs, alcohol ,jail time and eventually death. The Motherfuckers were forced to cal it quits. However, the original recording remained and on the DAT tape were nine other songs recorded at the same time. The intention was to eventually use these for another release. Since these nine songs never got released. A plan was made to release these with the original songs from the 7" as an LP.After all, the original seven-inch had sold out its original run and had never been repressed. So we took these seventeen songs , made it a full length and thus we have, THE MOTHERFUCKERS-WERE FUCKED FULL LENGTH LP! This record is a limited run of 1000 copies and they are on clear see through Mr. Yuck green vinyl!